Supports up to 2,000 sheets of 20 lb. or 75 gsm plain paper in A4, JIS-B5, Letter and Executive sizes. Paper, card stock, labels or transparenies may be used with the high capacity feeder. Tray-present, paper size, paper-present, paper-low sensing and transparency sensing are supported. 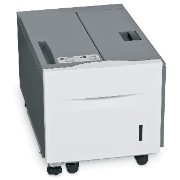 The High Capacity Feeder attaches to the left side of the MFP or printer. One of the 2520-Sheet Tandem Tray Module, 3x520-Sheet Drawer Stand or the 520-Sheet (A3) Drawer Stand is required to use the High Capacity Feeder. The High Capacity Feeder attaches to the left side of the configured MFP or printer. Supports up to 2,000 sheets of 20 lb. or 75 gsm plain paper in A4, JIS-B5, Letter and Executive sizes. Paper, card stock, labels or transparenies may be used with the high capacity feeder.